Background Over the last 30 years, there has been little improvement in the age of diagnosis of Duchenne muscular dystrophy (DMD) (mean age of 4.5–4.11 years). Aim To review the diagnostic process for DMD in boys without a family history in order to identify where delays occur and suggest areas for improvement. Design A retrospective case note review. Setting A tertiary centre for neuromuscular diseases in England. Patients All boys without family history diagnosed with DMD in the last 10 years (n=20). Outcome measures Mean age at four key steps in the diagnostic pathway of DMD. Results (1) Age at first reported symptoms of DMD was 32.5 (8–72) months (2.7 years). (2) First engagement of a healthcare professional was at 42.9 (10–90) months. (3) Creatine kinase (CK) levels were checked at 50.1 (14–91) months. (4) Diagnosis of DMD was confirmed at 51.7 (16–91) months (4.3 years). The total delay from parental concern to diagnosis was 19.2 (4–50) months (1.6 years). Conclusions Our study shows an improvement in the age of diagnosis of DMD although there continues to be a delay in presentation to a health professional and a delay in obtaining a CK test. To reduce these delays, we propose screening for DMD as part of the Child Health Surveillance Programme, in addition to lowering the threshold for CK testing in primary care by promoting a new DMD mnemonic MUSCLE. An earlier diagnosis of DMD will allow timely access to genetic counselling, standards of care and clinical trials. Duchenne muscular dystrophy (DMD) is a life limiting, muscle wasting condition. It typically presents with delayed or disordered motor or speech development and muscle weakness. Over the last 10 years, improved standards of care have significantly increased the life expectancy in DMD. In addition, new therapeutic approaches are being developed. Nevertheless, DMD continues to be diagnosed late. This negatively affects access to genetic counselling, standards of care and potentially recruitment into clinical trials. The age of diagnosis of DMD has improved but there continues to be a presentational and diagnostic delay. To further lower the age of diagnosis, we propose screening for DMD as part of the Child Health Surveillance Programme for children in the UK. We propose the mnemonic MUSCLE to raise awareness of the features of DMD and the importance of early creatine kinase testing in primary care. Duchenne muscular dystrophy (DMD) is an X linked condition characterised by progressive muscle weakness and wasting due to absence of the protein dystrophin in the muscles. DMD is the most common muscular dystrophy in children and affects approximately one in every 4000 male newborns.1 Affected boys typically present with disordered motor development or speech delay and muscle weakness in early childhood. Without treatment, the natural history of the condition is for affected boys to lose ambulation before the age of 13 and death in their late teens or early 20s due to respiratory or cardiac failure. Blood tests reveal elevated creatine kinase (CK) levels, reflecting muscle damage. In most cases, the diagnosis is confirmed on genetic testing, showing a specific mutation in the dystrophin gene. A muscle biopsy shows the absence of dystrophin in the muscles; however, a biopsy is now only recommended when initial genetic testing is inconclusive or the patient has an unusual phenotype. In these cases, a biopsy can be a rapid means of establishing dystrophin status and diagnosis which should still in every case be confirmed by sequencing. Since the introduction of steroid treatment, nocturnal ventilation and cardiac support in the last 10–15 years, as set out in the National Institute of Health and Care Excellence accredited Care Standards for DMD, clinical outcomes as well as life expectancy have significantly improved.2––4 A boy diagnosed with DMD today and managed according to these Care Standards has a good chance of living well into his 30s. There are several reasons why a delayed diagnosis of DMD impacts on quality of life and clinical outcome for boys. First, an early diagnosis of DMD allows parents to make informed decisions regarding future family planning. Second, it ensures early access to standards of care, including steroid treatment, physiotherapy and appropriate screening for cardiomyopathy. Third, it allows participation in research based registries and potentially allows access to clinical trials with new investigational drugs. Finally, if novel treatments for the condition are approved, it has been widely suggested that any intervention that potentially modifies the natural history of the condition may be of greater benefit in less damaged muscles; in other words, in younger children. In this study, we reviewed the age of diagnosis of DMD in our tertiary neuromuscular centre and compared this with published data over the last 30 years, including our own data from 1999. The aim of the study was to identify points in the diagnostic pathway of DMD that particularly contribute to the delay in the diagnosis and suggest specific areas for improvement. Clinical data for all boys with DMD diagnosed between 1 January 2003 and 1 January 2013 who attend the MRC Centre for neuromuscular diseases in Newcastle for diagnosis and management were reviewed. Only new cases with no family history of DMD were included in the study. For each boy included in the study, medical notes were reviewed for the data collected directly from parents at their first diagnostic visit to the muscle clinic. The following information was collected for each boy: age of first parental concerns (this was considered the age of first symptoms), age of first specific engagement of a health professional related to these concerns, age when CK levels were measured and age at which the diagnosis was genetically confirmed. The interval between first symptoms of DMD and first engagement with a health professional (presentational delay) and the interval between the first visit to a health professional and eventual diagnosis with DMD (diagnostic delay) were analysed. Information regarding symptoms at presentation, motor milestones, incidence of speech delay and presence of behavioural problems at presentation was also collected. General descriptive statistics were generated to analyse the data. Ethical approval was not required for this study. We identified 33 boys who were diagnosed with DMD at the MRC Centre in Newcastle over this 10-year period. Of these, nine boys were excluded from the study due to the presence of a positive family history of DMD. Four boys were diagnosed with DMD following an incidental finding of elevated CK; they were briefly analysed separately. This resulted in inclusion of 20 boys in this study. The diagnosis of DMD was genetically confirmed in all cases. Eight out of 20 boys had a muscle biopsy confirming absence or near absence of dystrophin in the muscle. Eleven mothers were found to be carriers (one carrier mother had (non-identical) twin boys who both had DMD). The three most common reported initial symptoms were (i) waddling gait (11 boys), (ii) difficulty with steps (eight boys) and (iii) falls (eight boys). In 18 out of 20 boys, there was a concern about delayed motor development. Nevertheless, the mean age of onset of walking (taking independent steps) in the 20 boys was 17 months (range 13–23 months). This is an interesting finding as this is below the 18-month milestone by which most healthcare professionals would raise concerns. In our group, only three boys walked later than 18 months indicating that the reliance on this motor milestone alone is not robust for screening for DMD. Speech and language delay has been reported in the DMD population. In our cohort, speech delay was a presenting feature in five boys and was documented in a total of nine boys (45% of all cases) at the time of diagnosis. Behavioural problems are also well described in DMD and concerns regarding the child's behaviour were reported by parents in four boys at time of diagnosis. These included immature behaviour (two boys), autistic features (one boy) and unspecified (one boy). The mean age of first reported symptoms of DMD was 32.5 months (2.7 years) with a range of 8–72 months (see table 1). The first specific visit to a health professional due to symptoms of DMD occurred between the ages of 10 and 90 months (mean 42.9 months). Initial concerns were raised most often by the parents (13 boys) followed by school or nursery (five boys), physiotherapist (one boy) and by the health visitor (one boy). In most boys, the first health professional involved was the general practitioner (GP) (11 boys), followed by paediatrician (four boys), health visitor (three boys) and physiotherapist (two boys). CK levels were checked at a mean age of 50.1 months (range 14–91 months). The CK levels were checked by paediatricians (16 boys), MRC Centre Newcastle (three boys) and a GP (one boy). The mean age of genetic diagnosis of DMD in our population is 51.7 months (4.3 years) with a range of 10–91 months. We subsequently looked in more detail at the delays between each step in the diagnostic process. We looked at the presentational delay and diagnostic delay. The presentational delay is the time from first reported symptoms to visiting a health professional for this specific concern. The diagnostic delay is the delay between first visit to a health professional and diagnosis; this delay is further broken down into the time between first visit to a health professional and CK test and the time between CK test and the diagnosis. The mean total delay in diagnosis is the time from first reported symptoms to genetic confirmation of DMD. Figure 1 displays the delays in the diagnostic pathway for each of the 20 boys, arranged according to length of delay in diagnosis. The presentational delay and diagnostic delay for each boy are displayed in individual columns and in different colours. The outliers in the graph are boy 1 and boy 20. In boy 1, there was no presentational delay as the boy visited a health professional as soon as there were concerns regarding his motor development. The large red column in this boy represents an exceptionally long delay in requesting a CK test, resulting in a subsequently much delayed final diagnosis (86 months). Boy 20, in contrast, has no diagnostic delay as he was diagnosed within 1 month of visiting a health professional; therefore, there is no red and green column (which graphically represents diagnostic delay). Display of individual delays in diagnostic pathway Duchenne muscular dystrophy (DMD). The X-axis displays each individual boy (n=20). The Y-axis represents the total delay (in months) for each boy from first reported symptoms (time 0 on Y-axis) to diagnosis. This total delay is divided into three parts. The blue part of the column is the delay from first reported symptoms to visiting a health professional (Symp-HP), the red part is the delay from visiting a health professional to the creatine kinase test (HP-CK) and the green part is the delay between CK test and the diagnosis of DMD (CK-Diagn). The mean total delay in the diagnosis is 19.2 (4–50) months. The mean presentational delay between the first concerns of the parents (32.5 months) and first specific engagement with a health professional (42.9 months) is 10.4 (0–34) months. The mean diagnostic delay between first visiting a health professional and subsequent diagnosis of DMD is 8.8 (0–50) months. The majority of this delay is due to a delay in obtaining a CK test, 7.2 (0–49) months. Once the CK result is available, the genetic diagnosis of DMD is confirmed 1.6 (0–4) months later; a tertiary specialist sees the child within that time in all cases. In a small numbers of boys (n=4) where the diagnosis was made incidentally due to CK testing during an unrelated illness, the mean age at diagnosis was much lower at 35.3 (10–57) months. 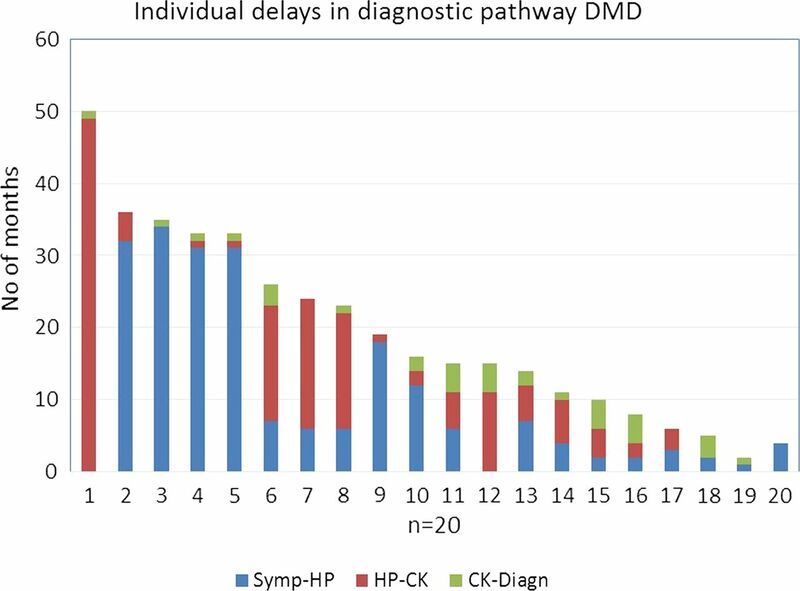 An analysis of the diagnostic process of DMD in the USA showed a similar presentational delay to our results (13 vs 10.4 months) though the diagnostic delay was significantly longer (15.6 vs 8.8 months).8 This was mostly due to a longer delay in obtaining a CK test after first visit to a health professional (13 vs 7.2 months), attributed to the fact that most children in the USA were initially seen by a health professional with no access to CK testing (physiotherapist or speech and language therapist). The total diagnostic delay is the USA is quoted as 30 months. In our study, 18 out of 20 children were initially seen by a GP, paediatrician or a health visitor and therefore should have access to a CK test. A delay of 7.2 months in obtaining a CK test is therefore unacceptable given that all boys were symptomatic and 18 out of 20 boys displayed delayed motor development at their initial visit to a health professional. An explanation for the delay in CK testing in our study is that in 19 out of 20 cases the CK test was performed in secondary care and therefore the time waiting to be seen significantly contributed to the diagnostic delay. In our study, only one GP requested a CK test (boy 20 in figure 1) resulting in a minimal diagnostic delay. This illustrates that in order to lower the diagnostic delay in DMD, CK testing needs to be requested directly from primary care. Even though the presentational delay in our study is better compared with other data, there is still a delay of 10.4 months between parents first noticing the symptoms of DMD and eventually visiting a health professional. The reasons for the prolonged presentational delay are multifactorial: some parents may not recognise early delayed development but more importantly there could be a missed opportunity in primary care to identify the early signs and symptoms of DMD in young boys. In our study, only one health visitor referred a boy to secondary care following observation of motor developmental problems. In the vast majority of boys, initial concerns were raised by the parents or a non-medically trained person, such as a teacher. In the UK, boys (aged 0–4) visit their GP on average six times a year and in addition have three routine health checks as part of the Child Health Surveillance Programme.12 ,13 These health checks are scheduled around the ages of 6 weeks, 1 year and 27–30 months. The 27–30-month health check is of particular importance. The aim of this check is to review general development, speech, social skills, behaviour, hearing and vision.13 The timing of this screening check is similar to the mean age of first parental concerns in boys subsequently diagnosed with DMD (in our study 32.5 months). Therefore, this review could be an ideal opportunity to identify possible DMD cases and reduce the presentational delay. To reduce the presentational delay in diagnosis of DMD, we propose specific screening for DMD at the 27–30-month health check. This could be done with the aid of a DMD mnemonic MUSCLE (see figure 2). This mnemonic reminds health professionals of the main features of DMD and stresses the importance of early CK testing. The MUSCLE mnemonic can also be used by GPs when presented with a child with gross motor problems or speech delay. We strongly advocate CK testing in primary care to reduce the diagnostic delay in DMD. Although we recognise the difficulties of taking blood samples from young children, the CK test is a cost-effective, readily available and highly sensitive and specific test. The impact of an earlier diagnosis should therefore support the recommendation of CK testing in primary care, either by the GP or a direct referral to a local paediatric day unit. 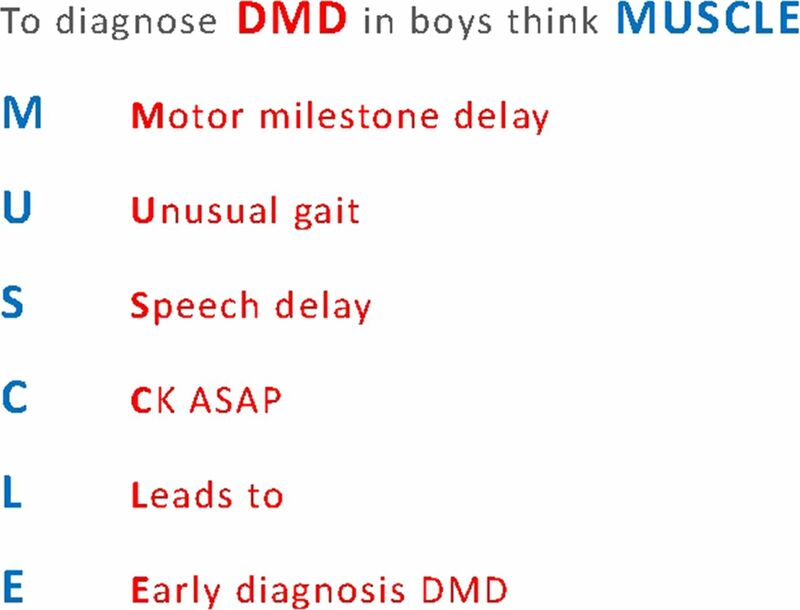 Duchenne muscular dystrophy (DMD) screening mnemonic MUSCLE. The mnemonic illustrates the main features of DMD and stresses the importance of early creatine kinase (CK) testing. The Neuromuscular Centre in Newcastle is part of the MRC Centre for Neuromuscular Diseases and a partner organisation of TREAT-NMD (http://www.treat­nmd.eu). The MRC Centre for Neuromuscular Diseases at Newcastle is a clinical and research centre of excellence of the Muscular dystrophy campaign (http://www.muscular-dystrophy.org). We would also like to thank Dr Pete Sewart for his help with the statistical analysis.
. Evidence based path to newborn screening for Duchenne muscular dystrophy. Ann Neurol 2012;71:304–13.
. Diagnosis and management of Duchenne muscular dystrophy, part 1: diagnosis, and pharmacological and psychosocial management. Lancet Neurol 2010;9:77–93.
. Diagnosis and management of Duchenne muscular dystrophy, part 2: implementation of multidisciplinary care. Lancet 2010;9:129–226.
. Current status of pharmaceutical and genetic therapeutic approaches to treat DMD. Mol Ther 2011;19:830–40.
. Failure of early diagnosis in symptomatic Duchenne muscular dystrophy. Lancet 1999;353:557–8.
. Delayed diagnosis of duchenne muscular dystrophy. Eur J Paediatr Neurol 2000;4:219–23.
. Delayed diagnosis in Duchenne muscular Dystrophy: data from the Muscular Dystrophy Surveillance, Tracking, and Research network (MD STARnet). J Paediatr 2009;155:380–5.
. Developmental progress in Duchenne muscular dystrophy: lessons for earlier detection. Eur J Paediatr Neurol 2004;8:145–53.
. No improvement in delay in diagnosis of Duchenne muscular dystrophy. Lancet 1995;335:590.
. Newborn bloodspot screening for Duchenne Muscular Dystrophy: 21 years experience in Wales (UK). Eur J Hum Genet 2013;21:1049–53.
. Pregnancy and the first five years of life. Healthy Child Programme. Department of Health, 2009.
. Early corticosteroid treatment in 4 Duchenne muscular dystrophy patients: 14-year follow-up. Muscle Nerve 2012;45:796–802. Contributors KB initiated the study, reviewed the data and co-wrote the paper. HJAvR and MG collected and analysed the data and wrote the manuscript. VS reviewed the final draft of the paper. Funding Dr Van Ruiten was supported by the Northumberland Tyne and Wear Comprehensive Local Research Network and the Northern Deanery. Data sharing statement The full data set and the statistical code are available from the corresponding author.